It sounded interesting, and seemingly fit all my criteria and more. The ingredients are mostly oils such as olive oil, coconut oil, castor oil, a little bit of New Hampshire spring water, sodum Hydroxide (a binder) and essential oils for fragrance. Since it was cheaper than most regular shampoos, I bought a bar to try it out. It doesn’t have a noticeable smell, so I can’t tell what essential oils were used. I rubbed the bar shampoo around in my wet hands to make a lather, and shampooed as usual. I can’t say my hair came out looking salon like, but it looks and feels CLEAN, and it’s not as dry as when using regular bottle shampoo with no conditioner, so probably all those oils in the bar soap are doing a good job of moisturizing. I used it on my guinea pig and it lathered up and rinsed out fast and complete ( a plus when bathing animals!). My husband tried it with his short hair and said he barely used any at all and it was effective. I got the wire chair as an attempt at a soap dish, and it seems to work well to keep the shampoo bar dry. I think the bar would melt into a sloppy mess if it didn’t have a place to dry out between uses. Here’s a tarp that can be set up that provides a hassle-free way to collect pure drinking water when camping. The surface can be used not only as a backpacking tarp to add weather protection for your hammock, but it also has a rainwater retention system made up of rain gutters and a suspension system to siphon water out towards the four corners where bottles are attached. When the bottles are full, they pull down the tarp, providing even better protection for the people below. The fabric includes both waterproofing and a heat reflective coating, so if it’s cold and stormy, the tarp can be set up with the reflective side on the bottom, and the dark rain retention side on the top to collect water. If it’s warm and sunny, the tarp can be set up with the reflective side out to help shed some of the heat from the sun. The total system is now available through Kammok. 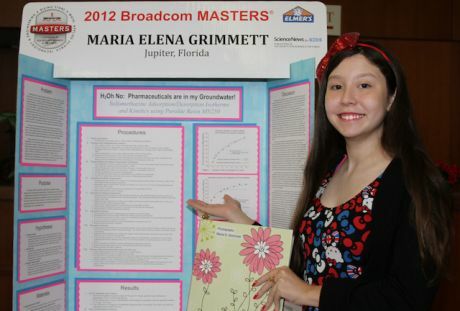 Maria Elena Grimmett, a 14 year old who is a noted research scientist, has won awards, published articles and more on the subject of removing ground water contaminants. As she watched pesticides being sprayed on the golf course grounds next to her house, she wondered if the contaminants could possibly get into the water system due to Florida’s shallow water table. Her research tenacity paid off with a little help from her parents, teachers, and mentors in the scientific community (including Russian scientist Dr. Vadim Davankov, whom she’s corresponded with about his invention of hypercrosslinked adsorbents). Maria Elena Grimmett’s dream is that “water engineers will be able to remove sulfamethazine from water around the world” using her research. Read more about her work here. Learn more here. Thanks to Gizmag for this article.